Beer Table Is high end Pub in Brooklyn, NY. An intimate dining experience where one sits at a l long bench with complete strangers fostering the perfect social environment. Beer Table gives beer the spotlight that it deserves by pairing with specially created dishes. A lower case 'b' and an uppercase 'T' serve as a bench and table. providing a sense of sophistication, the mark portrays an pub that focuses on an intimate experience with a beverage that is more than just beer. 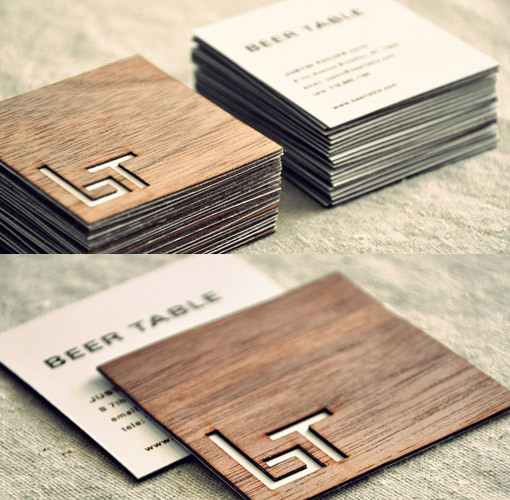 The cards are made of 2 ply laser cut oak wood, with 140 lb premium matte paper backing. Cards measure 2.5 in x 2.5 in.